I was excited to read about this 2,000 year old gold, emerald and pearl earring found some years ago during an excavation in Jerusalem at the City of David. I was doubly excited to actually see this earring at a Dead Sea Scroll exhibit at the Discovery Times Square Museum in New York City a few years back. Then, when I was visiting the excavations at the City of David in Jerusalem, I saw these replicas in the gift shop there for sale. 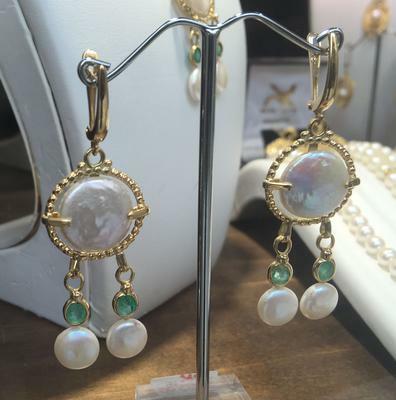 And in a jewelry store window, also in Jerusalem, but outside the old city, I saw these replicas of the same earring. Join in and write your own page! It's easy to do. How? 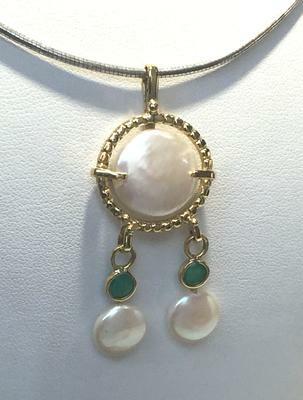 Simply click here to return to Favorite Pearl Jewelry.